The new Shadows of Evil map included with Black Ops 3 is far larger than any other zombie map to date. With so many different areas to explore, vertically and horizontally, it can be tricky to find Jug and the redesigned Pack a Punch. Don't worry though, follow the guide below to understand exactly how to find the Jug machine and get that precious extra health, but also locate the weapon upgrade machine (aka Pack-a-Punch) in Shadows of Evil. 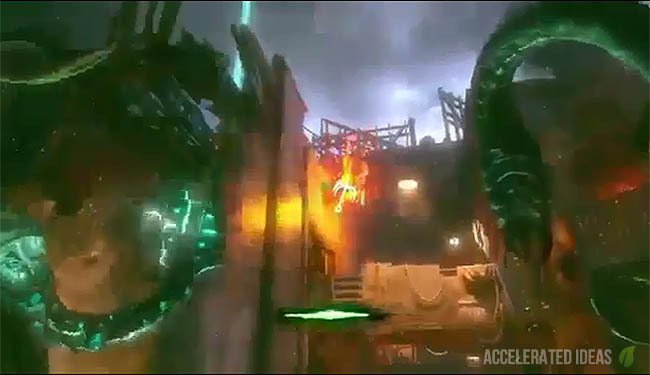 Veteran zombie fans will immediately notice that in Shadows of Evil you're given three chances to get hit before being downed. This is contrary to all other zombie maps where the usual two hits and you're down philosophy was implied. This doesn't necessary make the game a lot easier because you can still get cornered, but it does help against those unexpected windmill attacks which were so unfair in previous games. 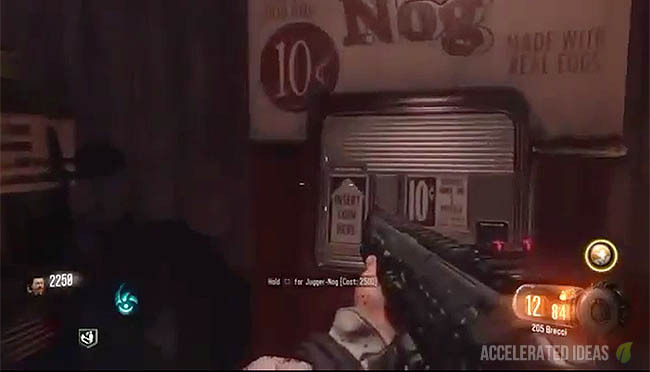 Everyone knows that the Juggernog perk is an absolute life saver in COD Zombies and that's no different in Shadows of Evil. Your usual 3 hit down now becomes 6 after you drink the Jug perk thus giving your more room to takes risks and fend off higher numbers of zombies later in the game. Whether it's still the first perk you should buy is a little debatable now that Gobblegum has been introduced, but outside of Quick Revive in SOLO, Jug is still a high priority perk for any player. Also note that in SoE, there's the option to "Become the Beast" by using the purple cauldrons scattered throughout the map. These are very, very similar to the purgatory mode in Mob of the Dead and some of the same mechanics apply. For example, when playing as the beast you can power up generators using your electrical attack and also grapple to higher (hidden) locations. Keep these tactics in mind when finding Jug. Lastly and most importantly, Jug will spawn randomly in one of three locations: Canal District, Waterfront District and Footlight District. The video link below shows each of the possible locations for Jug, or alternatively you can continue reading about a particular example for the Waterfront District. Once you understand where one of the locations is, you can repeat this similar process for each of the districts. Pro Tip: There are several broken bottles on top of crates in the Junction area, each bottle is just outside of the District's gate. It turns out that the colour of this bottle indicates what perk will be in that district. So if you see a broken RED bottle then Jug will certainly be in that district. This tip will save you time and money by not opening the wrong district first. You should see the Gobblegum machine in the middle. You can repeat this process for the Canal District and Footlight District. Just remember to use the first purple cauldron once you enter the district and grapple to the second floor. Then activate the perk machine and also power the switch so the stairs to the second floor are accessible. The weapon upgrade machine is your best friend when it comes to the higher levels. Not only will your base weapon become obsolete in higher rounds but the reserve ammo will also become a drag. Pushing a gun through the upgrade process will immediately improve its power and ammo capacity in addition to providing other benefits such as new scopes. 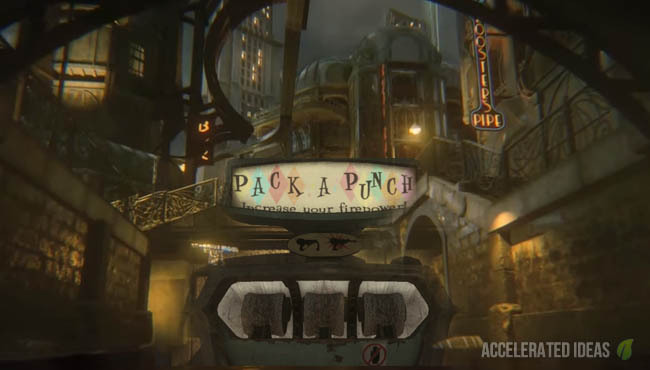 In Shadows of Evil, the Pack a Punch is well hidden behind a series of steps, similar in some ways to Origins which was hidden behind all the Power Generators. Until players powered all the generators, the Pack a Punch machine was unusable. See the steps below and keep your eye out for the blue portal (shown in image above), which is actually the PaP rather than the traditional machine. If you need help finding the ritual items, then see this walkthrough video. Collect the Ritual Items e.g. Lawyers Pen, Championship Belt, Hairpiece etc. These are found by breaking boxes or activating switches (while in Beast mode) in each of the ritual sites. Wait about 20 seconds and the Shadow Man will say "Your service to the overlords is appreciated"